Crankshaft Supply Re-manufactured Stock Cranks. These cranks are thermal cleaned, steel shot blasted, bolt holes and keyways inspected, centerline checked, straightened and magnafluxed. Necks, flanges and badly worn journals are restored, bearing journal surfaces machined, polished, oil holes chamfered, thoroughly cleaned, with filleted radius to maintain OE specs. Bearings are included with Crankshaft unless noted. Reman Crank Kit 1980-1983 Jeep 151cid, 2.5L, GM manufactured eng. 1960-1967 225cid, 3.7L, With Casting Number 284935, 2128492, 2264479. Centering Ring diameter is 1 31/32". 1961-1971 383cid, V8, Steel Crankshaft, With Casting Number 2206159. Flywheel Flange has a Centering RIng and 6 Threaded bolt holes. Steel crankshaft. Flywheel flange has a centering ring and six threaded bolt holes. 1962-1977 413cid, V8, Steel Crankshaft, With Casting Number 2206160. Flywheel Flange has a centering ring and 6 threaded bolt holes. 1964-1966 440cid, 7.2L, V8, Steel Crankshaft, With Casting Number 2206160. Flywheel Flange has a centering ring and 6 threaded bolt holes. 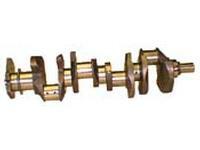 1966-1972 Jeep 440cid, 7.2L, V8, Steel Crankshaft, With Casting Number 2206160. Flywheel Flange has a centering ring and 6 threaded bolt holes. 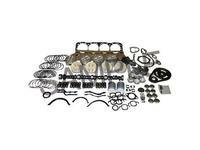 Includes crankshaft and matching bearings for the Chrysler 1978-2000 318 with Automatic Transmission. 1968-1978 225cid, 3.7L, With Casting Number 284935, 2128492, 2264479. Steel Crankshaft with Centering Ring diameter of 2 5/32" and Rod Journal width of 1.225". 1975-1987 225cid, 3.7L, With Casting Number 359886, 3698966, 4095246. Cast Iron Crankshaft with Rod Journal width of 1.000"
1970-1971 383cid, V8, Cast Iron Crankshaft, With Casting Number 3462923, 3751877, 4027172. Flywheel Flange has 6 threaded bolt holes. 1972-1980 400cid, 6.6L, V8, Cast Iron Crankshaft, With Casting Number 3462923, 3751877, 4027172. Flywheel Flange has 6 threaded bolt holes. 1974-1978 361cid, 5.9L, V8, Cast Iron Crankshaft, with Casting Number 3462923, 3751877, 4027172. Flywheel Flange has 6 threaded bolt holes. 1981-1985 135cid, 2.2L, Vin Code B, C, D, & E, With Casting Number 5214738, 5214990. Flywheel Flange has 6 Bolt holes. Will not fit Dakota Truck with standard shift transmission. 1986-1988 153cid, 2.5L, Vin Code K, With Casting Number 4273232. Neck Diameter is .866" or approximately 7/8"
1989-1995 153cid, 2.5L, Vin Code G & J, With Casting Number 448176, 486176, 4483176, 4448486, 4448490. Crankshaft fits on both turbo and non turbo engines. Neck diameter is 1.003" or approximately 1". Front of number 1 Main has 3 bolt holes for Timing Gear. 1987-2005 239cid, 3.9L, V6, Vin Code M & X, With Casting Number 4323738, 4323769. Rod Thrust width is .885", Standard drive Transmission, Requires pilot Bushing. 1986-1988 135cid, 2.2L, Vin Code C, D & E, With Casting Number 5214738, 5214990. Flywheel Flange has 8 Bolt holes. Neck diameter is .905" or approximately 7/8". Will not fit Dakota Truck with Standard shift Transmission. 1989-1994 135cid, 2.2L, Non Turbo Engine. Neck diameter is 1.003", With Casting Number 4448493. Flywheel Flange has 8 bolt holes. 1987-1988 135cid, 2.2L, Vin Code A, With Casting Number 4323814, 43292355. Inter-cooled turbocharger. Steel Crankshaft with neck diameter of .905". 1989 135cid, 2.2L, Turbo Engine with Steel Crankshaft. Neck diameter is 1.003". With Casting Number 25585. 1998-2006 DOHC Engine 167cid, 2.7L, V6, Vin Code R, U & V, With Casting Number J. 1999-2004 287cid, 4.7L, V8, Vin Code N, With Casting Number 53020683. Remove reluctor ring from old unit and install on new unit. 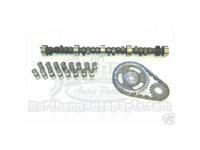 This Crankshaft kit fits applications for Rod Bearings with locating tabs. 1998-2003 195cid, 3.2L, V6, Vin Code J, With Casting Number A1D, B1A, 74K1, 94062803G4,. 24 Valve, SOHC, 60 degree Interference engine. 1996-2002 107cid, 2.0L, Vin Code C & Y, With Casting Number 4556721, 4557665, 4667755. Flywheel Flange has 8 Bolt holes. The Crankshaft has a reluctor ring machined into the front counter-weight. 1993-1997 300M 215cid, 3.5L, V6, Single Overhead Cam, Vin Code F & G, With Casting Number A1D, B1A, 74K1, 94062803G4. Cast Iron Block. 2003-2005 107cid, 2.0L, With Casting Number AA, 04884106. The Crankshaft has a bolt-on reluctor ring on the rear counterweight. 1998-2006 300M 215cid, 3.5L, V6, Single Overhead Cam, Vin Code G, K & M, With Casting Number A1D, B1A, 74K1, 94062803G4. Aluminum Block. 1995-2002 148cid, 2.4L, Double Overhead Cam, Vin Code B & X, With Casting Number 4621916. Flywheel Flange has 8 bolt holes. Crankshaft has notches cut in the number 2 counter-weight for electronic ignition. Non turbocharged engines only. 2003-2005 148cid, 2.4L, With Casting Number 04781590AA. Crankshaft has a bolt on reluctor ring located on the rear main. Remove reluctor ring from old unit and install on new unit. Non turbocharged engines only. 1972-1986 Jeep & AMC 258cid, 4.2L has centering ring on back of flywheel flange, 2-1/2' crank neck length with casting number 3214723, 3235477. 1983-1986 Jeep 150cid, 2.5L, Vin Code B, U. Casting Number 3239611, 3239811. Length of neck is 2-1/2" Long. 1987-1990 Jeep 150cid, 2.5L, Vin Code E, H, & Z, With Casting Number 8933002904. Length of neck is approximately 2 inches. 1991-2002 Jeep 150cid, 2.5L, Vin Code P, With Casting Number 8933002904. Length of neck is approximately 2 inches. 1971-1988 with a Mitsubishi G32 Engine, 97cid, 1.6L. Timing Gear fits flush to number 1 Main Journal. Neck has 2-Keyways. Pilot Hole adapter for automatic transmission is not furnished. 1971-1988 with a Mitsubishi G32 Engine, 97cid, 1.6L. Crankshaft has step between Timing Gear and number 1 Main Journal. Neck has 2-Keyways. Pilot Hole adapter for automatic transmission is not furnished. 1979-1982 with a 1995cc Mitsubishi G53B Engine 107cid, 2.0L, Vin Code 5 & U, With Casting Number G52. Main Diameter is 2.362". 1979-1994 Mitsubishi G54B Engine 2.6L, Front Wheel Drive, Vin Code D, E, G, & H, With Casting Number G54. Main Journal Diameter is 2.362"
1979-1994 with a Mitsubishi G54B Engine 153cid, 2.6L, Rear Wheel Drive, Vin Code D, E, G & H, With Casting Number G54. Main Journal Diameter is 2.362". 1995-2002 2497cc Mitsubishi 6G72 Engine 153cid, 2.5L, V6, Vin Code H & N, With Casting Number T3A, T3D, T3F, T3G, T3L, 09N, 19N, 29, 72, 76, 79. 1991-1996 with a Mitsubishi 6G72 Engine with turbocharger, 181cid / 3.0L, V6, With Casting Number E1, TDC, 72, 72P1. Forged Steel Crankshaft. 1985-1992 with a Mitsubishi G63B SOHC Engine 2.0L, Vin Code D, R, U, & V, With Casting Number GE, 64. Neck Length is 1-1/2". Flywheel Flange has 6 bolt holes. 1992-1997 with a Mitsubishi 4G63 Engine 2.0L, With Flanged Thrust Bearing. Flywheel Flange has 7 Bolt Holes. Main Thurst width located on number 3 Main is 1.005". On 1997 verify thrust type. 1997-1999 with a Mitsubishi 4G63 Engine 2.0L, Vin Code F. Turbo Application using Thrust Washers. Flywheel Flange has 7 bolt holes. Main Thurst width located on number 3 main is 1.005". On 1997 verify thrust type. 1993-2005 Mitsubishi 4G64 Engine 148cid, 2.4L, With Casting Number AT1, K. Main Thrust width is 1.005" and located on number 3 Main Journal. Rod Thrust Width is 1.050". Main Bearing set comes with Flanged Main Bearing. 1993-2005 Mitsubishi Engine 148cid, 2.4L, With Casting Number AT1, K. Main Thrust width is 1.005" and located on number 3 Main Journal. Rod Thurst Width is 1.050". Main Bearing set comes with Thrust Washers. 1985-1988 Mitsubishi G64B Engine 148cid, 2.4L, With Casting Number 64. Main Thrust width is 1.145" and located on number 3 Main Journal. 1989-1994 with a 1755cc Mitsubishi 4G37 Engine, 107cid, 1.8L, With 5 bolt holes in the Flywheel Flange.